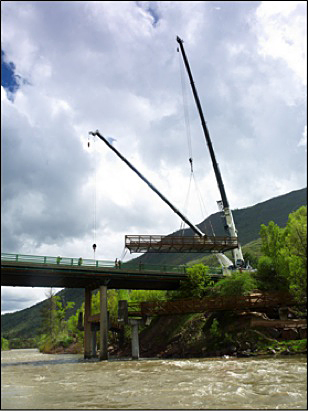 Construct path and install 8400 LF of 10ft wide colored concrete bike path along the Roaring Fork River in Glenwood Springs. Included is four bridge spans, totaling 265 foot built under the 27th street bridge. Two abutments and 3 piers were installed to support the bridge. Two of the piers were installed in the river and then reinforced with large riprap below the existing river bed to prevent erosion. River piers were constructed using a coffer dam in late November and early December. Boulder walls were constructed along the path as well as grouted rock walls in more elaborate landscaped areas. Topsoil from excavation activities was salvaged, screened and reused during final stabilization. The path was constructed in an old ditch right of way which made working conditions tight and required river bank stabilization to prevent further erosion during high water. Challenges included a multi season construction schedule, working in the river, as well as being flexible to design changes following requests of neighbors who lived on the trail. Working to limit disturbance in a tight work area as well as cater to the needs of the community during partial trail closures also created difficulties. This project had a high level of detail and required a large amount of subcontractors and suppliers to complete.